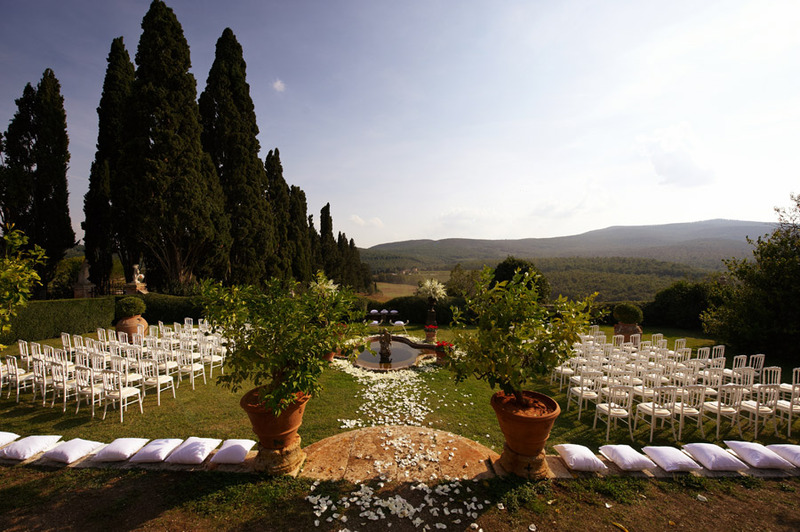 Romantic wedding venue in Tuscany: the perfect frame for unforgettable outdoor wedding receptions and wedding ceremonies. Tuscany, located in the Northwest of Central Italy, is not only famous for all its medieval towns, the wine from the Chianti region or beautiful and mile long coastlines – but also for its breathtaking landscape. For that reason Tuscany is perfect for outdoor wedding receptions and wedding ceremonies in Italy. Especially a nice Italian garden is one of the most beautiful outdoor wedding venues. Those gardens are created in a very romantic way and offer lots of space for big wedding ceremonies. Lots of couples choose an Italian garden as a venue for a symbolic wedding, but it is an ideal location for protestant or civil marriages as well. So if you are looking for a wedding location which has the typical romantic atmosphere that Italy is famous for worldwide, we can highly recommend you a romantic Italian garden in Tuscany.